Peoples in and around Madurai tell this story as the history of Chitirai Tiruvizha. Alagar (Lord Vishnu) is the elder brother of Meenakshi (Lord Parvathi). Alagar is located in Alagar Hills which is approx 20 KM from Madurai. Alagar was invited to attend the wedding of Meenakshi and Shiva in Madurai city. He started from Alagar Hills which is a dense forest even these days. In order to protect him and his belongings from robbers he decided to dress himself as a robber and travel to Madurai. He was tricked by God Indra in a divine play and so he was late by one day to his sister's wedding. When he was crossing the river Vaigai people told him that His sister got married without his presence. He got angry on this and knowing this Lord Meenakshi and Shiva also came to Vaigai river to explain him about the situation. He gave all the gifts he brought to Meenakshi and Shiva for their wedding to them in a Mandabam (A Small building) in the middle of river vaigai and returned back to Alagar Hill without entering Madurai. temple. This event declares the long event open. The flag will stay on the flag post until the end of the festival. Pattabisekam is coronation ceremony. Meenakshi is crowned as the queen of Madurai on this day and she will rule the Pandya Kingdom for the next four months and after that her husband Lord Sunderaswarar will be crowned as the king of Madurai for the next eight months. When Meenakshi amman is crowned as the queen of Pandya kingdom she went into war with all the countries in the world and conquered the whole world and she went to Kailaayam (The Place of Lord Shiva in Himalayas) to conquer that. But, on seeing lord shiva on the battlefield she fell in love with him and married him. Meenakshi Tiukalyanam is the great grand wedding celebration of Meenakshi amman and Lord shiva in Madurai. Lord shiva come to Madurai to marry Meenakshi is a grand wedding celebration celebration. The day after Meenakshi Tirukalyanam is Ther Thiruvizha (Car Festival). The King and Queen of Pandya Kingdom Lord Sunderaswarar and Meenakshi will come to see their citizens in a well decorated chariot which is a huge and Magnificent wooden structure. 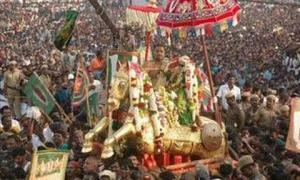 Thousands of peoples will gather at the streets of Madurai to pull the chariot and to witness the celebration. Part of the Chithirai brahmotsavam of Lord Kallazhagar Temple at Alagarkoil, the ‘Ethir Sevai' began on the fourth day of the festival. Alagar enters Madurai city and the people of the city welcomes him. Lord Alagar comes from Alagarkoil to Madurai slowly and by making couple of stops on the way. It is considered that when reaching the vaigai river bank, he hears that marriage is over, so he gets angry and returns back to Alagarkovil after giving the gifts to Meenakshi and sundereswarar and this event happens in a mandapam in the middle of river vaigai. The Chithirai Festival is a great opportunity to experience local life in Madurai, and see a traditional Hindu wedding ritual. The festival is celebrated with a great deal of excitement and hype -- with the enthusiasm of a real wedding. The celebrations extend all over the city, and the streets are flooded with devotees.